Former FBI Agent In Minnesota Charged With Leaking Classified Documents : The Two-Way The agent reportedly leaked secret documents to The Intercept that, among other things, indicate that the bureau continues to profile using race, ethnicity, nationality and religion. 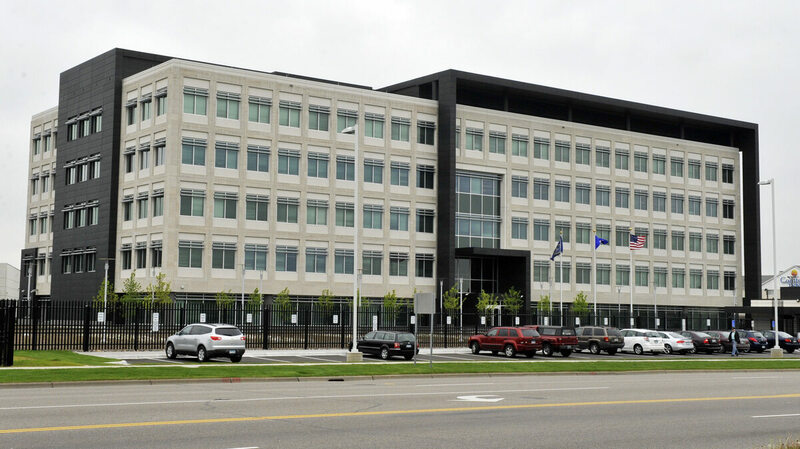 The FBI's Minnesota headquarters in Brooklyn Center, shown in 2012. A former FBI agent working on counterterrorism has been charged with sharing classified documents with a news organization, including documents that reportedly show that the bureau continues to use race and religion to profile potential targets. Attorneys for Terry James Albury said in a statement that their client was "driven by a conscientious commitment to long-term national security and addressing the well-documented systemic biases within the FBI." The charges come as the Trump administration has made prosecuting leaks by government employees to the media a high priority. In August, Attorney General Jeff Sessions announced that the Justice Department was launching a crackdown on the "staggering" number of leaks. MPR News says Albury was assigned as Minneapolis-St. Paul International Airport liaison working on counterterrorism matters. He was the only African-American FBI field agent in Minnesota, according to MPR. "Terry Albury served the U.S. with distinction both here at home and abroad in Iraq," the statement from the attorneys read. "He accepts full responsibility for the conduct set forth in the Information." The Associated Press writes that Albury was charged by "felony information, which typically indicates a defendant will plead guilty." The charges say Albury leaked the documents between February 2016 and Jan. 31, 2017. "The FBI believes that the classified and/or controlled nature of the documents indicates the News Outlet obtained these documents from someone with direct access to them," according to the warrant. "Furthermore, reviews of the FBI internal records indicate ALBURY has electronically accessed over two thirds of the approximately 27 documents via trusted access granted to him on FBI information systems." According to the AP, "The charges filed Tuesday also allege that from April 7, 2017, to Aug. 28, 2017, Albury willfully kept a document about an online platform used by a specific terrorist group for recruitment, and failed to give it to an officer and federal employee who was entitled to it." "A request for a search warrant filed in Minneapolis federal court against Albury did not identify the news outlet, but a review by MPR News found the documents described in the search warrant that Albury leaked exactly match the trove of FBI documents posted by The Intercept. In January 2017, The Intercept published a series titled 'The FBI's Secret Rules,' based on Albury's leaked documents, which show the depth and broad powers of the FBI expansion since 9/11 and its recruitment efforts.'" Among those reports is one that claims that the FBI "still claims considerable latitude to use race, ethnicity, nationality, and religion in deciding which people and communities to investigate." A statement from The Intercept's editor-in-chief, Betsy Reed, said: "We do not discuss anonymous sources. The use of the Espionage Act to prosecute whistleblowers seeking to shed light on matters of vital public concern is an outrage, and all journalists have the right under the First Amendment to report these stories." "The affidavits also pointed to discussions between Albury and a co-worker in 2015 in which they weighed reporting what they said was an inappropriate e-mail sent by another colleague. During the discussion, the affidavit read, Albury wrote in an e-mail that 'if [the Office of Professional Responsibility] does not respond, let me go on record and say i will contact the press.'"